The Duetto office building project will be constructed in the same area where YIT has previously carried out the Grand Office business premise and Prisma hypermarket projects, along the Vilnius ring road. Finnish construction company YIT is undertaking two significant projects in Vilnius and Bratislava. First up, the company has commenced construction of an energy efficient office premise in the Lithuanian capital. Located in the Vilspa area, Duetto is to consist of around 8 200 m2 of leasable area, with an additional underground parking facility for 200 cars. The project’s completion is slated for the beginning of 2017. Meanwhile, YIT has also acquired a six-hectare plot for a significant area development project in Bratislava. 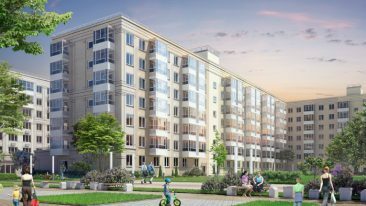 Located 15 minutes from the city centre, over 1 000 apartments are set to be constructed in Ruzinov, creating a total living area of some 60 000 m2. Commercial spaces and parking lots are also planned for the development. The project will be constructed in 10 phases, the first of which is scheduled for a 2016 completion.